Anglers wetting a line in the Murrumbidgee River have given CSU and NSW Department of Primary Industries researchers a valuable insight into recreational fishing of Murray cod and golden perch. Anglers wetting a line in the Murrumbidgee River have given Charles Sturt University (CSU) and NSW Department of Primary Industries researchers a valuable insight into recreational fishing of Murray cod and golden perch. The results of a survey by NSW DPI Fisheries scientist and CSU PhD student Mr Jamin Forbes will help fishery managers to better understand and improve the fishery. As part of Mr Forbes' research through CSU's Institute for Land, Water and Society, recreational fishers were surveyed on a 76 kilometre stretch of the Murrumbidgee River, between Berembed and Yanco Weirs, from 2012 to 2013. "The Murray cod and golden perch are important species targeted by recreational fishers across the Murray Darling Basin," said Mr Forbes. "The fisheries are controlled by size and bag limits and gear restrictions and there's also a closed season for the Murray cod from today, 1 September to the end of November. "The research focused on a river reach that is popular for recreational fishing and has previously experienced declines in native fish stocks. "We surveyed recreational fishers who gave us information about the rate at which fish were captured and harvested, and also the amount of effort involved, which allowed estimation of catch and harvest over the 12 month survey." The research found high Murray cod catch rates, considerable angler involvement, and that over 90 per cent of Murray cod captured were released. "The survey reach contained a very active Murray cod fishery which would suggest a recovering fishery," Mr Forbes said. "However golden perch catch rates were poor which may indicate low numbers of this species or that anglers preferentially target Murray cod. "We also found there was similar fishing effort between the Murray cod open and closed seasons. The Murray cod catch rates were also similar but anglers weren't keeping these fish during the restricted period. "The low golden perch catch rates suggest that fishing effort expended during the closed season may be related to anglers' desire to go fishing and practice catch and release of Murray cod, and they were either unaware of or ignored the negative impacts of this fishing method," said Mr Forbes. 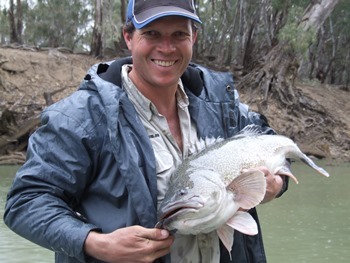 "The closed season aims to protect spawning Murray cod, but effectiveness of this management strategy may be reduced by deliberate by-catch during the closure period. "More research needs to be done to understand the impact of catch and release fishing on the spawning of Murray cod. "We're also recommending greater education on fishing techniques that minimise Murray cod by-catch during the closed season." The project was funded from the NSW Government's Recreational Fishing Trust. Mr Forbes' is the lead author of research titled, Recreational Fishing Effort, Catch, and Harvest for Murray Cod and Golden Perch in the Murrumbidgee River Australia, which has been published in the North American Journal of Fisheries Management. He is supervised by Associate Professor Robyn Watts and Dr Wayne Robinson from CSU and Dr Lee Baumgartner from La Trobe University (previously NSW DPI Fisheries).